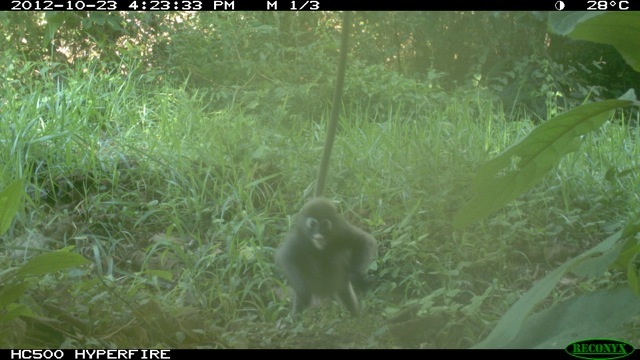 This playful dusky leaf langur (Trachypithecus obscurus), which was caught on a camera trap in the Kenyir Wildlife Corridor last week, was all smiles probably because it knew of some good news coming our way. WHAT IS IT?? The first piece of good news is that the Terengganu state government has decided to freeze development along the Kuala Berang highway bisecting the proposed Kenyir Wildlife Corridor, pending recommendations from environmental consultants working for the federal government. These recommendations are to be submitted by the end of the year. This decision was reached after we shared our research findings in Kenyir with Dato’ Toh Chin Yaw, Terengganu Chairman of Industry, Trade and Environment Committee, Terengganu State Government. Many thanks to Dato’ Toh for sharing the pictures and videos of Kenyir’s biodiversity with other government officials. Yesterday, this piece of great news was covered by a local news portal, fz.com. 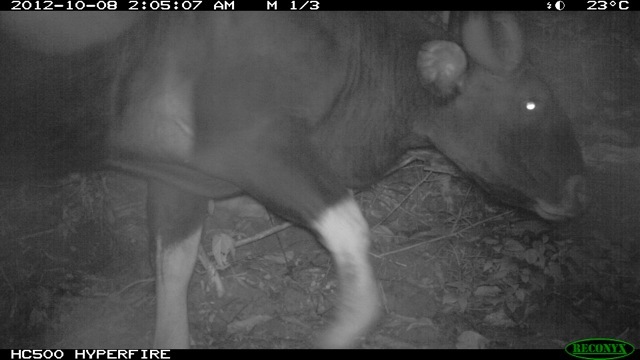 The second piece of good news is that we finally got a camera-trap picture of the elusive seladang or gaur (Bos gaurus) after 2 years of field work in the Kenyir Wildlife Corridor! We only recorded a single individual, which was detected by two separate cameras. Although we still have a lot to do to secure protection for the Kenyir Wildlife Corridor, we are working closely with the state government to implement our recommendations. For now, we would like to extend our deepest gratitude to the wonderful people who have supported the Kenyir Wildlife Corridor project. Special thanks also go to Anuar McAfee for helping and working with us on this (Anuar also helped us get the flying foxes protected). Stay tuned for more updates! * Update 8 November 2012: More extensive coverage, from the very excellent Mongabay: click here!